Note: The grey letters show you the villain and the golden ones the one behind the mask! The Black Knight is being transported to a museum by prof. James Hyde White, but the professor mysteriously disappears and the knight becomes alive. When the gang find it, they go to the museum and investigate. 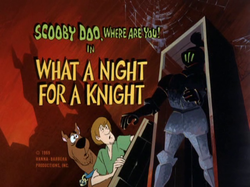 In the night, they sneak inside as a wild goose chase happens with the Black Knight and the rest of the gang. At the end, the knight is captured and it turns out that it was Mr. Wickles! He was stealing the original paintings and replacing them with fake ones, that he and his allies made in a secret room behind the mummy case, and the only one who could sneak in his business was professor Hyde White, so he had to get rid of him with hiding him into the museum! The gang go at the Rocky Point Beach, when a green-glowing ghost in a diving suit gets out of the water. When they investigate, they hear about the boats, who have vanished around this area and the legend of Captain Culter. When they visit his wife, she tells them everything that has happened, and how, since she practices witchcraft, she has turned him back to life, seeking for revenge. As they now dive into the sea, there is a wild chase with the Ghost of Captain Cutler as at the end, setting the trap, the gang reveal it really was Captain Cutler and he never really died, they just made it up with his wife. He was just hijacking boats with his diving suit as a seaweed, that can be found only into the Graveyard of Ships, got on his suit, making it glow and that's how the legend came up! The gang are having not such a great time going around with their small boat, but it all spoils even more when they crash in a mysterious island. It's not just any island, but the Haunted Isle with its spooky legends! As the kids explore the island, they find a castle, the Vasquez Castle. When they enter it, a phantom haunts them. The Phantom of Vasquez Castle seems pretty real, since he goes through walls and objects can go through him, but it's just another mystery the gang need to solve! When they catch the phantom and unmask him it's Bluestone The Great, a magician who disappeared few months ago. 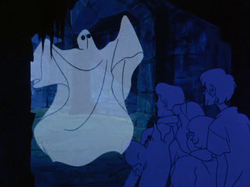 He was searching for a treasure, that seems to not exist, and he used the legend of the phantom to scare the kids away using projector and a mirror for making the phantom real and other tricks! When Shaggy reads the map wrong, he takes the gang to a ghost town, actually Gold Town, that once lived in gold, but now it seems like there's no one home! When they get to the only working hotel, Big Ben and Hank, who tell about the legend of the Miner 49er, the one who has been walking around the city, scaring off people. The two are very suspicious, so the gang start investigating as they go to the old abandoned mine. 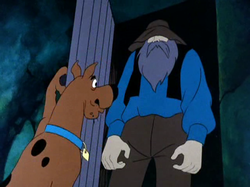 After they split up, Shaggy and Scooby run into the walking ghost, as a wild goose chase happens, until they get together and make a plan, scaring off the Miner 49er, revealing it was Hank all the time, who wanted to make a fortune of the mine, since it had "black gold" and didn't want to share it with Big Ben! While walk, Scooby sees a beautiful puddle getting kidnapped and taken away as he alarms the gang! When they go to Buck Masters, one of the victims who lost his dog, Big Red, he tells them that he thinks this dognapping is because of an upcoming dog show! 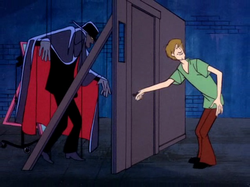 So the gang now disguise Scooby as a dog, that could win the dog show, Champion, and so is he taken away, but Shaggy and the others follow him, as they get attacked by the Ghost of Geronimo (a projection)! When they get to an Indian village, they enter it with many trap doors and chases around with the Indian Witchdoctor! When the kids set the trap it turns out that it was Buck Masters behind the mask with the help of his henchman Mike! They wanted to kidnap all dogs that might win the competition so their dog would win and get the prize! 06. What the Hex is Going on? The gang are headed to their friend Sharon Wetherby's house, when she and her father tell them that their uncle is missing, but the gang have seen a man walking in the mansion next door, the Kingston Mansion. It is true, but now uncle Stuart seems to have grown old as the Mystery Inc. start to investigate! After Sharon is kidnapped they go to the Kingston Mansion as they follow the Ghost of Elias Kingston to the cemetery, leaving a clue that leads them to the city to consult with a swami! However, it turns out that Scooby is the only swami and the ghost interferes again, but now in a crystal ball on a flying table (remote-control)! After Stuart seems to have grown so old he died, the ghost of Elias is unmasked and it was Stuart Wetherby all along, who wanted the family's fortune with tricking them! The gang are the Epi-Center Film Company's movie "The Ape Man of Forbidden Mountain" of which Daphne's uncle, John Maxwell, is the director. When they're shooting a scene with the Ape Man, he starts attacking the actress Candy Mint as it seems that this is not the stuntman, Carl, who's been captured and kept hidden! After a fake rolling Ape Man doll attacks Scooby, they continue with investigating, but their first capture is Shaggy, instead of the prehistoric man! Going through a dark tunnel and back to the set, using a camera Shaggy and Scooby reveal that the Ape Man is Carl, the stuntman. He wanted to revenge on the movie's production for not getting the lead role (which was taken by Candy), but it didn't work out for this monkey! 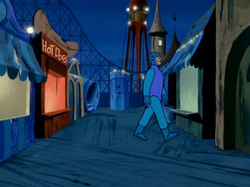 When the gang are at the beach, they spot that a carnival named Funland has been opened, when Velma's claiming that it shouldn't have opened till next week, so they chose to investigate! When they get there, everything seems to be working on its own, but there is a robot running around too! After the gang chase around with the robot going from one ride to another, they spot a house, where Mr. and Mrs. Jenkins live, the caretakers, denying everything! 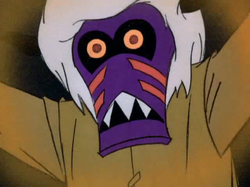 When the gang are back in the Carnival, they chose to set a trap for this super-human or robot, but nothing would stop him until Mr. Jenkins coming with a super-magnet, stopping the robot! It was Sarah Jenkins all along, who wanted to prove that Charlie The Robot cannot take care of Funland! After that, they repair Charlie and make him a good robot! Shaggy and Scooby are eating their pizza, which was supposed to be taken home, as a car drives by and a violin case falls out of it. However, in it there are a lot of money. 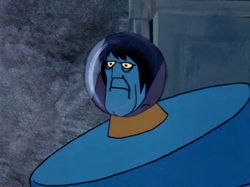 However, the driver uses a puppet to trick Scooby into getting the violin case, however the puppet he leaves points the gang to "Pietro's Puppets". As they're greeted by the doorman, Fred finds a clue, which is a fake dollar and later they return! When they do, the Puppet Master is after the girls and the boys, doing a whole "puppet show" for the gang, when they find a secret room with empty violin cases, soon to be filled with money. Even the doorman made them believe that he was another puppet, it was him, Pietro, all along behind the mask doing dirty business trying to scare off the kids! While the gang are on their way, they crush into two men that work in the circus, Samson and Max, as they go to the circus talking to Mr. Barnstorm, the owner, telling them about an evil clown attacking. 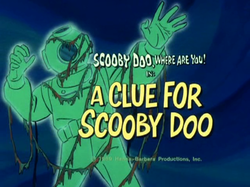 The kids leave, but they go after Scooby and chose to solve the mystery! 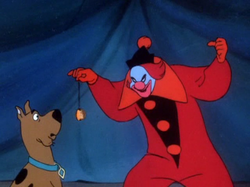 The Ghost Clown strikes first on Scooby with his hypnosis trick and soon does the same to Daphne and Shaggy, while locking away Fred! After a balloon tricks the kids that it's the real ghost, they use the clown's trick against him, hypnotizing him and revealing that it was Harry the Hypnotist, who once worked at the circus until he was caught stealing and got fired, so he came back for revenge into making Mr. Barnstorm's business fall apart!